After increased talk of a General Strike after the October 20th protest and an upcoming European strike, John Millington asks if the UK will see one. “Are you prepared for a general strike?” bellowed Unite leader Len McCluskey during his speech to thousands of workers who flooded into Hyde Park after a noisy anti austerity march on October 20th. The leader of Britain’s biggest union got the deafening roar of approval he was expecting and a “show of hands” vote from the crowd indicating overwhelming support for his suggestion. But was McCluskey’s classic piece of 70s trade union theatre designed purely to get the blood pumping or was it, as he claimed, a genuine attempt to “begin the consultation” on the practicalities of a general strike? Are workers in Britain really prepared to walk out en masse against austerity? The term “general” or “generalised” strike action has been bandied around the trade union movement for decades particularly during spikes of industrial unrest. 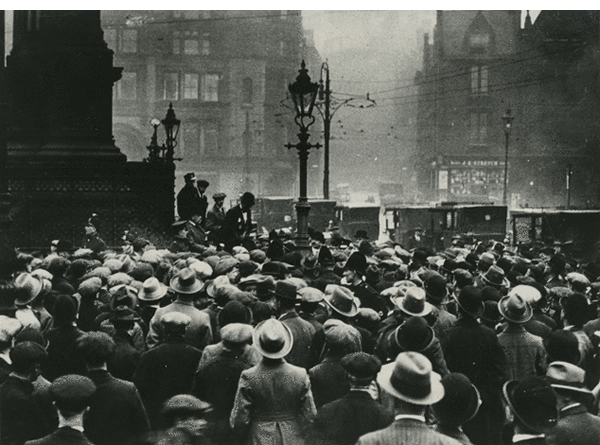 Britain has only ever had one general strike in 1926 which ended in defeat for the trade union movement. However, the re-emergence of the concept and momentum behind such a call during austerity has its roots in frustration at the cuts, Labour’s timid opposition to the status quo, and workers drawing inspiration from mass strike actions across Europe. With the TUC opening the door to look at the possibility of such action at their recent congress, militant union leaders have the sanction of officialdom to “ask the question” at every opportunity. The idea has also been given legal sanction, with employment experts John Hendy QC and Professor Keith Ewing arguing the government may not be able to rule such action illegal. With that in mind, what did those on the TUC “A Future that works” demo make of McCluskey’s strike call? “Let’s have a 24 hour general strike. Bring on the revolution,” says Ivan Monckton, Unite executive member for agriculture. His industry has been decimated by government policies particularly in the so-called “bonfire of the quangos” which saw the Agricultural Wages Board abolished. The board was responsible for regulating minimum standards of pay and conditions and allowed unions to play a full role. Unite has warned the loss of the AWB lead to huge reductions in pay and grinding poverty in the countryside. Monckton added that, with more people likely to die as a result of industrial accidents, agricultural workers would be up for “anything” that was part of fighting back. Another marcher and blacklisted construction worker Dave Smith has seen similar devastation wreaked upon his industry. Smith’s sentiments on the need for action have found some unlikely supporters. Others, however, are far more sceptical about such an event taking place anytime soon. Retired firefighter John Drake insists the focus should be on beating specific government policies with localised campaigns rather than a mass walkout; an experienced union campaigner, Drake is totally opposed to the government and wants local anti-cuts groups to mobilise against specific government austerity measures in their localities. Others question the willingness of workers to take such a giant step forward despite unprecedented austerity. There are around 2.5m private sector employees in unions out of a total union membership of just under 6 million across all industries. That represents only a fraction of the total workforce which stands at just under 30 million. But if millions of workers across key industries such as transport, construction, off-shore oil workers and the public sector took strike action at the same time, the impact would be more significant than at any time recent history. November 14th will see what some are calling the first “European wide general strike” which is expected to see millions of workers walk out in four European countries (Belgium, Portugal, Holland and France). Workers in Britain may not be among them but anger, frustration and desperation is building. Militant trade union leaders know they don’t need a majority of workers to strike; they just need an organised minority to shut the country down for a day. the unions destroyed the coal industry and a general strike of public sector workers would get the public on side for a wide-scale reorganisation (downsizing) plus a further ‘re-alignment’ of their pensions. bring it on! Very good article. But to add a rider, the European general strike it’s going to be in Portugal, Spain, Italy and some other countries and will be supported by demonstrations in other places like France or Germany. That’s right, you’ve already done a lot to crush the ability of workers to talk to each other, and you continue to press for outlawing it in many ways. Shows your true commitment to free speech issues! 3. The BBC must die! Ah yes, further RIPPING OFF of the only pensions worth the name, you mean? So that, in face, it will cost the taxpayers MORE…the ONLY scenario which can cause that, when people stop paying into them! And right, slash those NASTY NHS workers and teachers, stop providing those NASTY police, fire and ambulance services! Yes, bring on further poverty. You love it! “you’ve already done a lot to crush the ability of workers to talk to each other” – can you elaborate on who has stopped workers talking to each other and how? Right right. So in that case your right wing press must be banned at first sight. As usual, you’re AFRAID of any media which does not uncritically support your view, and which has in this case a duty to be balanced (and isn’t, it’s supporting your side more – but it DARES admit other views exist!). And why would it be “sore”? Again, I’m not the one who’s admitted to alcohol abuse here. Polymorphic shill, if you’re unaware of the history of British politics in the last few years, I’m not about to give you links…you’ll just ignore them as always. That you DON’T know is telling of course. Are you a UK student leader REALLY interested in changing the UK political + economic scene? IF YES, contact us ([email protected]). The global banks are criminal enterprises. do you mean the encitement to racial and religious hatred free speech stuff? forget a general strike, let’s have a civil war!!! I know who’s side I’d be on. Again, in English this time? Well of course you’d be on the side of the 1%. And?